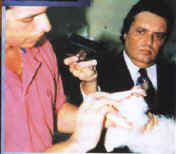 In October 1995, Luis Guadaloupe walked into his local police station in the town of Canovanas on the island of Puerto Rico in the Caribbean. He had an unusual story to report to the police - whilst going about his normal business for the day, he had a strange experience. Luis had encountered a bizarre creature -"It was really ugly, like a demon, around four to five feet tall with huge elongated red eyes. It moved like a kangaroo - jumping on its powerful back legs. It had a long pointed tongue which moved in and out of its mouth. It was gray but its back seemed to change colour - it gave off a foul "sulphuric-like stench". Since 1995, from all parts of the island, many people have witnessed this creature - some describing it with a ridge of spines on its back. Furthermore, farmers and local people have lost thousands of animals - cattle, sheep, goats as well as dogs, cats and birds - their gruesome deaths being attributed to the strange creature. When examined the bodies of the slaughtered animals frequently reveal shocking and dumbfounding evidence - small holes in the neck or head and a complete absence of blood in their bodies. Hence, the people of Puerto Rico gave this strange creature the name "La Chupacabra" - the Goat-sucker. In early 1995 a police officer was sent to investigate an animal which had been found mutilated. When he arrived at the scene he discovered a mutilated sheep and whilst examining the body he became aware of something watching him from the shadows. He was staggered to see a creature about five feet tall with dark skin and orange-yellow eyes. When the creature left the scene the police officer chased it only to be quickly overcome with a severe headache and nausea. He soon collapsed. The existence of this strange creature can hardly be denied but, despite the fact that hundreds of people on Puerto Rico have seen "Chupacabras", descriptions do vary. Some eyewitnesses describe the creature with wings - others do not. Another aspect of these strange events is that quite often sightings of UFOs accompany the discovery of the mutilated remains of animals. A photo of a Chupacabra? Probably a fake. "I believe there is a strong connection between the Chupacabras and UFO activity in this area. Many people who witness the Chupacabra also report some sort of aerial phenomena. These witnesses - separated socially as well as geographically, give remarkably similar UFO descriptions. I don't think this can be ignored when trying to understand the Chupacabra phenomenon. At first I believed these animals to be the result of some genetic or bionic experiment, but I now believe that they are not of terrestrial origin. I have confidential sources that have informed me that two Chupacabras have been captured by the authorities here and are being studies in conjunction with U.S. investigators - there is a possibility that someone, somewhere knows exactly what is going on. Right now, I would say the situation is out of control. It's happening everywhere and government officials who are elected by us to solve our problems are not doing this at the moment". These remarks attracted widespread derision and accusations of a government cover-up - a cover-up assisted by the media. Taking into account the vast number of animals killed, the numerous eyewitness accounts and terribly mutilated bodies, the official explanation does, without doubt, appear doubtful - at the very least. Some researchers have suggested that the Chupacabras are the result of some kind of covert genetic experiment conducted by the military. These points are valid because there is ample evidence of the US military using Puerto Rico for experiments involving illegal weapons and a whole variety of top-secret projects - such as Agent Orange and Thalidomide. Also experiments using "radiation weapons" have been carried out on the island. "Whatever it is, it's highly intelligent - today it is attacking animals, but tomorrow it may attack people." Juan - a local peasant farmer told of how 30 animals had been killed in one night. Earlier that evening may eyewitnesses claimed to have seen UFOs. Sightings spread to 40 of the 70 Puerto Rican municipalities and, in fact, sightings are being made in all parts of the island - does this mean they are rapidly breeding? In deed, reports of Chupacabras began to emerge from places far away from Puerto Rico - Miami, Texas, Florida, California and Northern Mexico. Hundreds of attacks have been reported in Mexico and in some cases more than 60 animals have been slaughtered - all of them had circular holes, usually in the neck. Whereas Chupacabra attacks in Puerto Rico were limited to animal mutilation, in Mexico it has been claimed that the creature has attacked people. How the Chupacabra managed to migrate from Puerto Rico to U.S. mainland is not clear - the two countries are separated by 1000 miles of water. But it is clear that descriptions of creatures seen in California are the same as the Puerto Rican Chupacabra. June 2002, for two years now Chupacabras have been sighted in Chile, attacks seeming to take place in areas with a notable presence of docile domestic animals apparently to obtain their blood. Attacks have taken place in the town of Calama - the victims included chickens, rabbits, lambs, cats and even some horses. Eyewitness accounts of various "Chupacabra attacks" tend to agree in details and, in April 2001, local residents formed a neighborhood watch to protect livestock that was being attacked by these strange creatures. When witnessed the attacks all involve a similar creature - described as a Chupacabra, a strange animal or an "alien" - capable of making long jumps using two or three legs. The farmers' dogs, which are usually fierce and do hesitate to attack strangers, are afraid and would rather hide when the creature is near. It is noticeable that the "Chupacabra" is afraid of light and will run away if lights are turned on. The following report took place in Calama - it has may similarities to other reports in the area. Initially the "Chupacabra" was observed on the roofs of houses adjacent to another property where domestic animals are kept. "It was not a man; it did not look like a person. It resembled an ape and it jumped all over the roof. It passed right in front of my window and then it came back making all sorts of noise. I didn't want to turn on the light because I was very afraid and my windows don't have screens. I was afraid the animal would break in. I cannot explain exactly what happened - all I know is I was very scared". "It was after midnight. Suddenly I heard loud noises from the roof. The creature went by my window. It jumped a lot - making very long jumps, unlike the way a person jumps. Suddenly I saw my father coming out of the door on the first floor and the creature jumped. It jumped so far that it landed on top of the neighbour's house. No person jumps so long without running and gaining momentum. Then it finally left. I was able to listen to the neighbour yelling "There it is, there it is". It finally ended up across the street. I knew that because the dogs across the street began barking and howling. Moments later there was nothing but silence". Maria's father is of the opinion that the creature could have been on their property for some time before they were aware of its presence. "I have never seen anything like that, as if it was a monkey that jumped on two legs and sometimes three. It was about 1.5 metres tall, perhaps more, but it was stocky. It made a lot of noise. I could not sleep during the entire night". Maria's father mentioned that someone had been seen chasing the creature as it was leaving but despite all the noise there was no damage to the sheet metal roof. He added: "The noise was definitely made by something heavy but it left no track or trace of itself". Although none of the farm animals were harmed, the local residents were left living in fear. 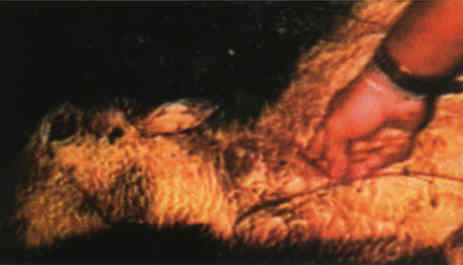 July 2002, following a massive wave of reports of animal mutilations and UFO sightings in Argentina, it was speculated that the attacks on animals were caused by Chupacabras. September 22nd 2002 - Ponce, Puerto Rico. 19 fighting roosters, ducks, chickens and rabbits - all dead, were found by the owner, Ramon Luis Guzman Colon, some outside their cages at a residence in the La Calzada neighbourhood. The owner remarked: "This is weird. I think it was the Chupacabras who slew my animals. I'm scared and alarmed by what occurred". (He probably has some idea of what his roosters have to face up to when forced into fighting - Author's note). Guzman Colon added: "It's weird; they swapped the roosters from one cage to another. At two a.m. I heard the dog barking in the alley and when I came downstairs the dog vanished. I heard no noise whatsoever and went back to bed. I got up at 6-30 a.m. and found the animals dead. The way they were bitten (neck and back) cannot be attributed to dogs. Even the dog is scared." In deed the dog was seen cowering in the hollow of a tree and some large tracks were found - with claw marks which were not those of a dog.